MyWay Mobile Storage of Pittsburgh is pleased to announce that Pittsburgh Market Owner, Ed Sickmund received the 2015 “Notable Networker Award” from his Business Networking International (BNI) chapter, Circle of Excellence. L to R Allison Caffas, Caffas Law and President of BNI Chapter COE, Jim Easton, US Mortgage Network, Becky McKinney, Wright Business Systems and Ed Sickmund Owner MyWay Mobile Storage of Pittsburgh. MyWay Mobile Storage of Pittsburgh is pleased to announce that Pittsburgh Market Owner, Ed Sickmund received the 2015 “Notable Networker Award” from his Business Networking International (BNI) chapter, Circle of Excellence. Sickmund made the most referrals (80) to the other businesses in the group during 2015. BNI’s website notes that networking requires commitment. Circle of Excellence, one of 29 Pittsburgh area BNI chapters, meets Wednesday mornings in Wexford. 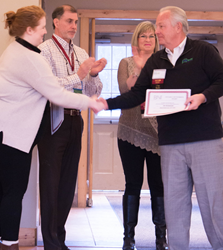 The most successful chapters of BNI are comprised of participants who are sincerely committed to helping one another through networking. BNI is the largest business networking organization in the world. They offer members the opportunity to share ideas, contacts and most importantly, business referrals. BNI provides a positive, supportive, and structured environment for the development and exchange of quality business referrals. It does so by helping you build personal relationships with dozens of other qualified business professionals. Last year, members of BNI passed millions of referrals that generated 9.5 billion dollars of business for each other. To learn more about BNI visit http://www.bni.com/ and for BNI in Western Pennsylvania visit http://www.bni-westernpa.com. MyWay Mobile Storage is the leading provider of moving and storage solutions and located in a spacious 27,500 square foot facility in West Mifflin, PA to better service their customers in the metropolitan Pittsburgh area. They provide quick and easy do it yourself moving containers that can be delivered right to your door and stored in their climate controlled, secure storage facilities. Sickmund and Myway Mobile Storage are also involved with the Realtors Association of Metropolitan Pittsburgh (RAMP), National Association of Professional Organizers (NAPO), Business Networking International (BNI) and the South West Communities Chamber of Commerce (SWCCOC), where Sickmund currently serves as board president. To learn more about MyWay Mobile Storage, visit http://www.mywaystorage.com or call 888-336-9929 to speak with a Moving & Storage Consultant.